Superfoods, I love them. My tiny kitchen is filled with a wide range of superfoods; from the well known goji berries and home grown wheatgrass to the less known baobab powder and lucuma powder. This month my blog is all about superfoods. I will try to share my knowledge about as much superfoods as I can, in order to guide to way through the superfoods jungle. Maca is a root from Peru. The root is cooked, dried and then made into powder. Maca is rich in vitamin B vitamins, C, and E. It provides plenty of calcium, zinc, iron, magnesium, phosphorous and amino acids. Maca is widely used to promote sexual function of both men and women. It serves as a boost to your libido and increases endurance. At the same time it balances your hormones and increases fertility. Maca relieves menstrual issues and menopause. It alleviates cramps, body pain, hot flashes, anxiety, mood swings, and depression. Add Maca (about 1 tbs) to your smoothies or breakfast (oatmeal/granola). Mulberries grow from the Morus Alba try mostly in Asia and Africa. Mulberry is a powerhouse of nutrients and is an excellent source of protein. 3 ounces of mulberry has 9 grams of protein. Mulberry is a huge source of iron, calcium, Vitamin A, C, E and K, Folate, thiamine, Pyridoxine, Niacin and fiber. The antioxidants found in mulberry repairs free radicals. Resveratrol, an antioxidant, is found plentiful in mulberries. It helps to promote heart health and overall vitality. Mulberry is also rich polynutrients like anthocyanin, flavonoids, lutein, zea-xanthin, B carotene and A carotene. Add mulberries (about 2 tbs) to your breakfast, smoothies, salads or eat them as a snack. One of the highest sources of antioxidants (has anti-aging effect). 180% of daily recommended Vitamin A intake per 1 ounce serving. Goji Berries are also a rich source of both selenium and germanium and have hence been used in a number of clinical trials involving cancer patients. When given to patients undergoing chemotherapy, the berries conferred significant protection for the liver. 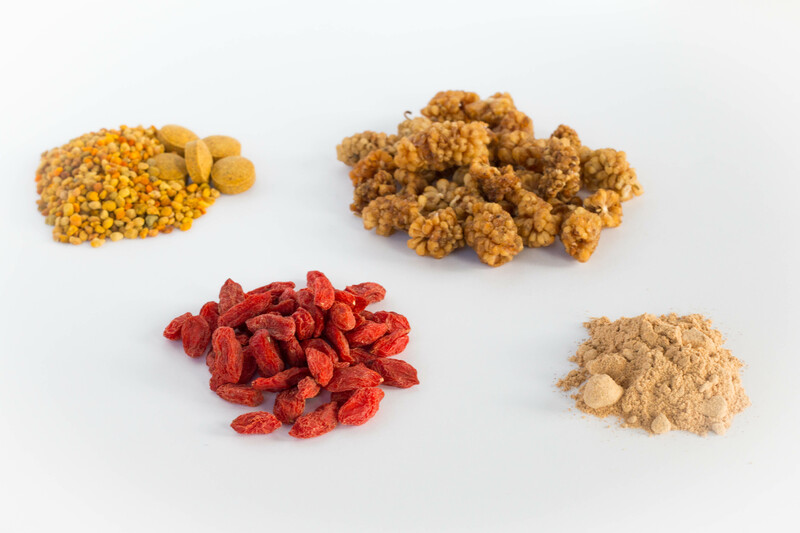 In Oriental medicine, they are said to correct chi deficiency, meaning that people with low energy, insomnia, heart palpitations, and even anxiety are more comfortable after consuming goji berries. The berries have 18 amino acids (higher than bee pollen) and 21 trace minerals, linoleic acid, and more beta-carotene than carrots. Add about 2 tbs of goji berries through your breakfast, smoothies, juices, salads or snack them. 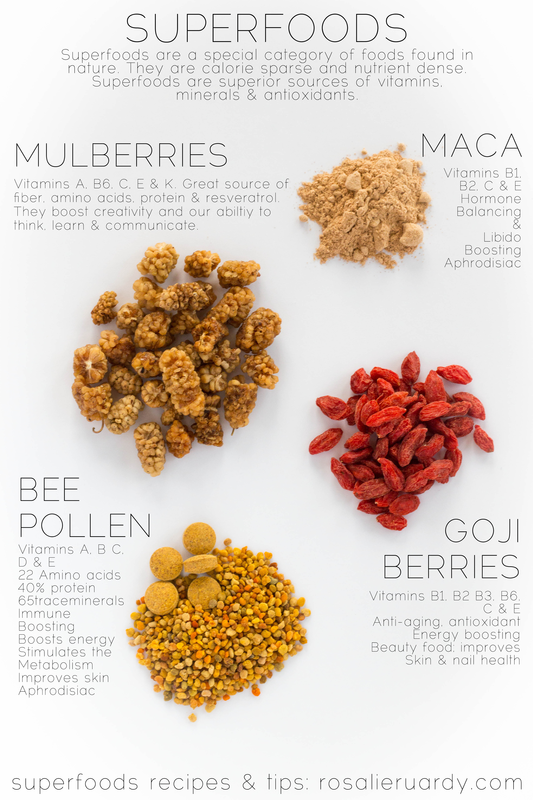 Energy: The range of nutrients found within bee pollen makes it a great natural energizer. The carbohydrates, protein and B vitamins can help keep you going all day by enhancing stamina and fighting off fatigue. Skin: Bee pollen is often used in topical products that aim to treat inflammatory conditions and common skin irritations like psoriasis or eczema. The amino acids and vitamins protect the skin and aid the regeneration of cells. Respiratory system: Bee pollen contains a high quantity of antioxidants that may have an anti-inflammatory effect on the tissues of the lungs, preventing the onset of asthma. Allergies: Pollen reduces the presence of histamine, ameliorating many allergies. Dr. Leo Conway, M.D of Denver Colorado, reported that 94 percent of his patients were completely free from allergy symptoms once treated with oral feeding of pollen. Everything from asthma to allergies to sinus problems were cleared, confirming that bee pollen is wonderfully effective against a wide range of respiratory diseases. Digestive system: In addition to healthful vitamins, minerals and protein, bee pollen contains enzymes that can aid in digestion. Enzymes assist your body in getting all the nutrients you need from the food that you eat. Immune boosting: Pollen is good for the intestinal flora and thereby supports the immune system. According to holistic health expert Dr. Joseph Mercola, bee pollen has antibiotic-type properties that can help protect the body from contracting viruses. It’s also rich in antioxidants that protect the cells from the damaging oxidation of free radicals. Aphrodisiac: Bee pollen stimulates and restores ovarian function, therefore may be used to assist in accelerating pregnancy. As well as being a hormonal booster it is also a great aphrodisiac! Add them (about 1 tbs) to your smoothies, breakfast or salads. Thanks for your excellent information. They’re very useful. Check to help investors research the professional backgrounds of current and former FINRA-registered brokerage firms and brokers. write-up to him. Surely he’ll have a good read. Many thanks for sharing! Прошу прощения, что вмешался… У меня похожая ситуация. to look for it. You can shop for clothes, bags, shoes and other different stuff online. knowledge about this topic. Your points are well made and relatable. Appreciation to my father who informed me about this blog, this web site is genuinely amazing. about the company. But if you are a beginner, simply do your best to match story elements to this structure. you do not miss out on any important guest. of the greatest weight-loss foods around.